This Pratt crow was never used to hunt with. It is mint with no cracks or repaint. 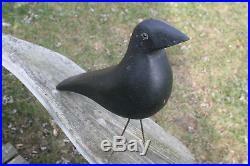 William Pratt made very few of these crows in the 1920's. He tried to emulate the shape of the crows produced by Charles Perdew. 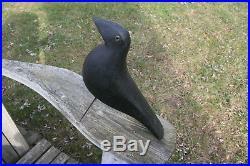 These crows were 10 high with clear glass eyes and included two wire legs. 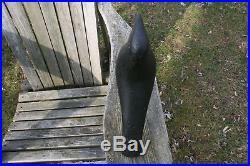 This decoy would be a must for a Pratt collector or any serious Factory Decoy collector. See this model displayed on page 308 of Ken Trayer's North American Factory Decoys (the bible). 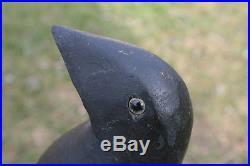 The item "Vintage Pratt Factory wooden crow decoy mint" is in sale since Saturday, December 15, 2018. 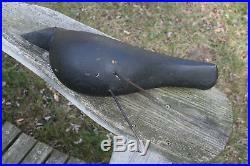 This item is in the category "Sporting Goods\Hunting\Vintage Hunting\Duck Decoys"." and is located in Towson, Maryland. This item can be shipped to United States.